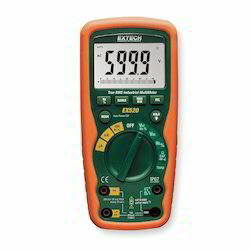 Digital multimeters or voltmeters are used by electrical contractors and service technicians across a wide range of trades including appliance repair, HVAC, IT, handiwork, and predictive maintenance. Extech’s unrivaled digital multimeter selection ensures you’ll find the best multimeter for your job and your needs – simplifying troubleshooting, installation, and testing. True RMS DMM with 40,000 count large LCD display, temperature function and waterproof housing. Ruggedly designed and waterproof to IP67 standards, the Heavy Duty True RMS Industrial MultiMeter (EX 530) is ideal for use in the outdoors, on boats, and in any harsh industrial environment. It has a double molded housing and is drop-proof up to six feet with a safety rating of CAT IV 600 Volt and CAT III 1000 Volt. It measures AC/DC voltage and current, resistance, capacitance, electronic and electrical frequency, temperature, 4 to 20 mA, and duty cycle. Additional features include: 0.06% basic accuracy, continuity beeper, diode test (2.8 Volt open circuit voltage), 40000 count resolutions, backlit LCD with barograph, peak hold, min/max, relative mode, data hold and 1000 Volt input protection for all functions. We are an outstanding manufacturer and supplier in the domain, betrothed in providing the best in quality gamut of Pocket Multimeter NCV with test leads and A23 12V battery. 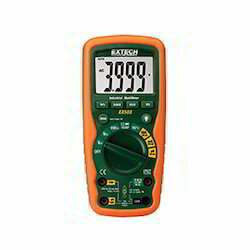 Having CAT II-300 V rating, this multimeter is ideal to be used for precise determination of current, voltage and resistance without making physical contact. This multimeter is carefully manufactured under the prudent observation of skilled professionals at our advanced production premises. 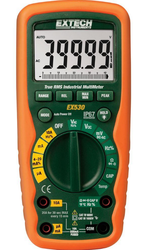 Furthermore, this Pocket Multimeter is available with us in varied technical specifications at reasonable prices within promised delivery time. Ruggedly designed and waterproof to IP67 standards, the EX530 is ideal for use in the outdoors, on boats, and in any harsh industrial environment. It has a double molded housing and is drop-proof up to six feet with a safety rating of CAT IV 600 Volt and CAT III 1000 Volt. It measures AC/DC voltage and current, resistance, capacitance, electronic and electrical frequency, temperature, 4 to 20 mA, and duty cycle. Additional features include: 0.06% basic accuracy, continuity beeper, diode test (2.8 Volt open circuit voltage), 40000 count resolutions, backlit LCD with barograph, peak hold, min/max, relative mode, data hold and 1000 Volt input protection for all functions. Comes complete with double-molded test leads, type K bead wire temperature probe (-4 to 482 degrees F/-20 to 250 degrees C), magnetic hanging strap, case, and a 9v battery. The EX230 Mini Digital MultiMeter with built-in IR Thermometer can quickly identify overheating motors and locate hot spots on electrical panels and HVAC vents without contact. The EX210’s rugged design incorporates a 4000 count large backlit dual LCD with easy-to read digits, low current capability measure down to 0.1µA, and input fuse protection. The built-in IR Thermometer has a 6:1 distance to target ratio. This meter also features Type K Temperature, Frequency, Capacitance and Duty Cycle measurement; relative function and data hold capabilities as well as auto power-off. The EX230 comes complete with test leads, Type K Temperature bead probe and a 9V battery.